Webcam Porlamar: Isla Margarita - A livestream from Porlamar, Isla Margarita. Porlamar: Porlamar Beach, 0.4 mi. Maraval (Trinidad): Weather in Maraval, 158.8 mi. St. George's: HD Stream Beach, 158.9 mi. Grand Anse Beach: Native Spirit Scuba on Grand Anse Beach, 159.7 mi. Ciudad Guayana: Webcam and Weather, 199.2 mi. Caracas: City View, 209.4 mi. Kralendijk, Bonaire: Beach View, 307.1 mi. Bonaire: Lac Bay Surfcam, 310.7 mi. 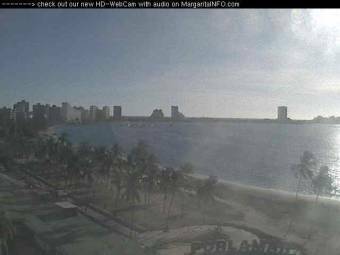 This webcam Porlamar with the theme Seaview was added on December 22, 2004 and is operated by MargaritaInfo.com. It got 30373 visitors since then. Shouldn't this webcam work or should the link be wrong please report that here. You can add this webcam here to myCams.